If you asked my husband, he’ll clearly tell anyone, I don’t need any triggering reason to go insane… ❤ He’d state that in a very loving way, and yet, he’d say it! Leaving the social media aside, now let’s move to another common boiling point-trigger: The School Moms. Oh, my! This is for the many parents out there, especially the ones who try to get involved with their kiddo’s school activities. I’ve got a question for y’all: have you ever had any issues with [not of them, but they’ve got representatives all over the world] the PTA mafia? If you don’t know what I’m talking about, there’s no need to worry, and it also means you haven’t had any bad experiences with the before-mentioned group – for the ones who understand my pain, that’s enough said! I’m born and raised Latina, so I believe I’ve got a pass to share my two cents on this. In most of latino countries, people never miss an event; they’re also, never on time! I try my best to get all my household act together before heading out to work. I’m currently living and working at a latino country – the perception of regular/expected work hours seem to differ from one person to the other. And why? Latinos don’t believe in a set time, for anything! [again, I can speak out my thoughts ’cause I was born in Brazil, and when I last checked, it’s part of the colorful/wonderful Latino community!]. You wanna plan a dinner starting at 8, remember to tell your guests dinner is scheduled for 6. Most people will be there at/around 8:30. It’s a good technique, and you don’t stress out. You’re throwing a birthday party for your toddler, and it should run from 2-4, don’t expect the lovely little ones [and their respective families] to depart before dinner time. That said, get your post-birthday-dinner ready for the tardy ones – they’ll likely overstay, and they’ll surely be hungry! Do these type of issues make my blood boil inside my veins? Author 3rdCultureChildrenPosted on March 31, 2014 March 31, 2014 Categories ART, children, expat, FAMILY, foreign serviceTags crazy, daily prompt, she drives me crazy, writing prompt16 Comments on What Drives Me Crazy? Muito obrigada! A habilidade de poder escrever, entender e comunicar em várias línguas tem sido uma vantagem sem preço para toda a minha família. E para tanto, sou muito grata. 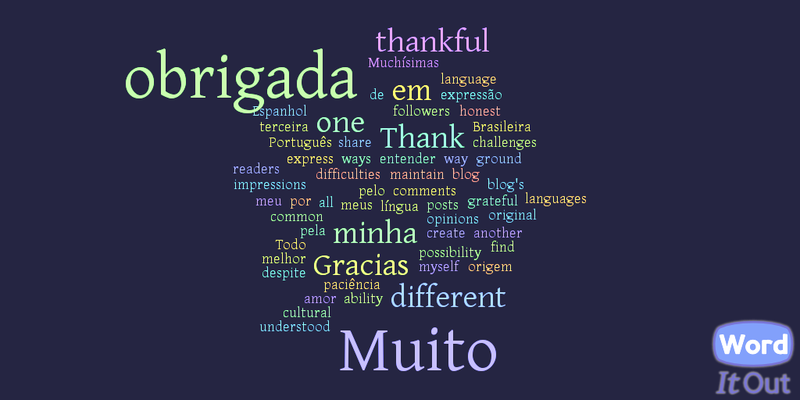 Obrigada pela possibilidade de compartilhar um blog cuja principal língua é o Inglês, e no entanto, ainda ser capaz de manter o Português da minha origem brasileira, com meu marido e filhos. Obrigada pela possibilidade de usar no trabalho, uma terceira língua aprendida, o Espanhol. Languages have become part of my life. I need communication tools in more ways than one, and for all they ways I’ve been [mis]using languages, I’m very thankful. Muchísimas gracias por la posibilidad de comunicarme con otros en un país tan distinto del mio – Bolivia. Gracias! Thank you! Obrigada! Author 3rdCultureChildrenPosted on September 12, 2013 September 12, 2013 Categories ART, LANGUAGETags daily prompt, gracias, obrigada, Portuguese, postaday, Spanish language, thank you, writing prompt11 Comments on Muito Obrigada! Children in adult-oriented places: a collection of [random] thoughts! “Everyone loves kids, right? Right! Except when they don’t. This week, we’re particularly interested in what you think about kids in adult-oriented places. I think most of us can agree that it’s not a good idea to drag little Sally to a bar at 1AM, but what about a museum? A fancy restaurant?” [Michele M. from King of States]. Well, as a parent of 3 little kids (oldest one just turned 7), moving every two years, due to family work requirements, having to adjust not only to a new country, as well as to new cultures, new languages, there’s yet the expectation that [shockingly!] my kids should also re-invent themselves and adjust/adapt to new social demands/requirements, showcasing the pristine behavior only found in movies about expat children attending boarding schools, spending their spear time learning an instrument and being part of book clubs! This theme, discussing the pros and cons of having children in adult-oriented/adult-only social places got me thinking. And I began reading through what others had to say about it [I’m such a curious cat!]. I’m also the ‘household fairy’, you know, that one silent worker, that makes the breakfast show up in the morning, the lunch packs being ready before the school bus turns the corner… the ‘laundry fairy’, the intense PTA volunteer. Unfortunately, there hasn’t been enough time to ‘school’ my children on the ‘perfect social behavior‘ [whatever it is or means] – I’m still trying. And my children are also trying to learn, the best they can. They’ve been to restaurants, airports, family gatherings, embassy functions, social events, you name it! making pizza, at a ‘kid-friendly’ restaurant! But, should we, as parents, carry out our frustrations to a public setting? Would it be enjoyable to ourselves, and to others? Kids deserve people to respect them. And, do you believe they [the children] would be receiving their deserved share of social respect, if others [adults] would feel uncomfortable with their presence? Tough call. My parents always had to travel for work. We moved a lot. We were also three children, the only difference was that, being the oldest one (9 years older than the youngest), I was responsible for their social behavior. For all that, even if it’s hard, logistically challenging, last-minute need, try to find yourself a baby sitter. That’s my little 2 cents of advice, and one may do whatever it wants with it, even completely discard it. Just my humble suggestion…. Adult-oriented places are for adults only [clever conclusion, right?!]. Unfortunately, for the ones who would like to spend quality time with their children, tagging them along wherever they go, I’m sure there’ll be other alternatives… they’re called ‘kid-friendly places’. Trust me, kids don’t enjoy adult-only scenarios. I’ve been there. I’ve tried both ways, and I’d stick to the second one. It’s safer for the adult parent, the adult company, and for the children. Author 3rdCultureChildrenPosted on October 23, 2012 February 24, 2013 Categories children, EDUCATION, expat, foreign service, TCKsTags blogging, DPchallenge, parenting, taking a kid to a bar?, writing, writing prompt20 Comments on Children in adult-oriented places: a collection of [random] thoughts!